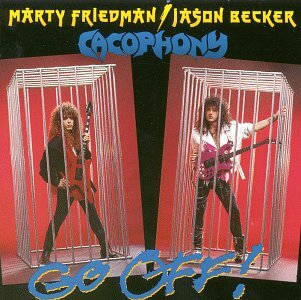 Cacophony is a United States neoclassical speed metal/shred band formed in 1986 by guitarists Marty Friedman and Jason Becker. The band also featured Atma Anur on drums and Peter Marrino on vocals, although the main focus of their music was the guitars. Cacophony is often recognized for its technically challenging, neo-classical metal elements. 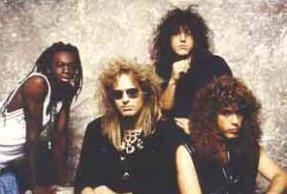 Their first album, the predominantly instrumental Speed Metal Symphony, fused classical and hard rock styles with Friedman's preference towards exotic scales (especially obvious in the song "The Ninja"). It featured exceptionally fast, melodic and technical music that could only be equalled by other virtuosi such as Yngwie Malmsteen. It has been heralded as one of the most awe-inspiring instrumental guitar albums of all time. The title track, "Speed Metal Symphony", was an incredible combination of amazing lead solos and fast rhythm guitar. Their second album Go Off! was a commercial failure. Besides Becker, Friedman and Marrino, it featured a new bassist and a new drummer. The drums were played by Deen Castronovo, however the picture of new drummer Kenny Stavropoulos was included on the back cover. Go Off! featured a more song oriented approach, valuing songwriting as much as display of skill. The guitar playing is more technical and the harmonisation of the lead lines and solos resulted in interesting double harmonies that wildly differed from the common "Iron Maiden harmony style". Though the second album was a commercial failure, it spawned cult followings around the band. 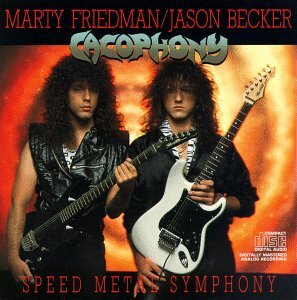 Cacophony broke up with Jason Becker joining David Lee Roth and Marty Friedman joining Megadeth. Friedman and Becker have since left Megadeth and David Lee Roth's band respectively (in Becker's case due to amyotrophic lateral sclerosis). Both released several solo albums that include a wide variety of music. Jason Becker's album Perpetual Burn is considered one of the greatest neo-classical shred albums of all time. PUBLIC SERVICE ANNOUNCEMENT: It should be noted that, on iTunes and last.fm notably, Cacophony's music is falsly represented, instead TECHNO music has been posted, presumably as the artist's name is the same.